I’m not sure what happened to last week’s Tuesday Table Setting post. 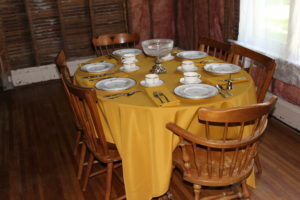 It’s that time of year when I am very busy getting The Mansion ready for tours, cleaning up my lawns and gardens, and preparing for the upcoming visitor season. One of the things I get the most excited about is what china, flatware, etc. I will be using on the table for the season. For Living History 2016, I wanted to use some of my Limoges china, so I used the salad plates on top of my Nippon dinner plates (both thrift store finds), and tea cups and saucers that complimented both. Four of the tea cups and saucers are Linton by Noritake; the other two are of unknown manufacture (rummage sales). Flatware was my everyday set by Fifth Avenue Stainless (Woolworth); I do not know the pattern name but it has roses on it that mimic the yellow roses in the Limoges. The table cloth and matching napkins are Smithson by Excel (Herberger’s). The centerpiece is my cut glass crystal compote made in Western Germany (thrift store), and at the host’s seat is a silver plated bell by International Silver Company (thrift store). I normally do not put the forks on the napkin, but due to a lack of space at the table, it was unavoidable. Living History 2016 table setting using Limoges, Nippon and West German pieces.